The Brother CE1008 Sewing Machine: A Bargain or a Bust? Home Resources The Brother CE1008 Sewing Machine: A Bargain or a Bust? Sewing can be a fun hobby or a tedious chore, depending on your equipment. With digital technology, however, modern sewing machines provide a host of options never seen before. One of these features is computer-programmed stitches like you’ll find in the Brother CE1008 sewing machine. A computerized sewing machine provides simple, one-touch settings that turn a chore into a pleasure. If you enjoy sewing clothes or home décor items, you’ll need a variety of stitches to complete your projects. The Brother CE1008 provides 100 different stitches you can access easily without consulting complicated manuals. You won’t miss a beat when switching from zig-zag stitches in kids’ clothes or decorative top-stitching for cushion covers. Brother is one of the most established sewing machine manufacturers in the country, and there’s a good reason for this. They launched back in 1908 as the Yasui Sewing Machine Company in Japan. You may have heard of the company because of their business electronics, including printers, typewriters, and adding machines. However, this area of the business wasn’t added until the early 1960s. Even though Brother sewing machines have been in production for over 100 years, the company continually upgrades their technology. In 2017, the 60-millionth Brother sewing machine rolled off the assembly line. In 2018, they announced the release of “StitchVision” technology, which uses light projection to help sewers preview stitches before making them. 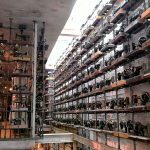 So, despite a long-established history, Brother sewing machines are undoubtedly ready for the future. The Brother CE1008 isn’t the latest model, but it’s surely one of the most versatile. For beginning sewers, it serves as the perfect starter model that will elevate your projects. The range of features and programmed stitches will take the guesswork out of sewing as you learn the tricks of the trade. Without complicated dials and switches, you’ll be able to concentrate and learn more about cutting, tailoring, and constructing garments. For experienced sewers, the Brother CE1008 provides easy access to all your most-used stitches. 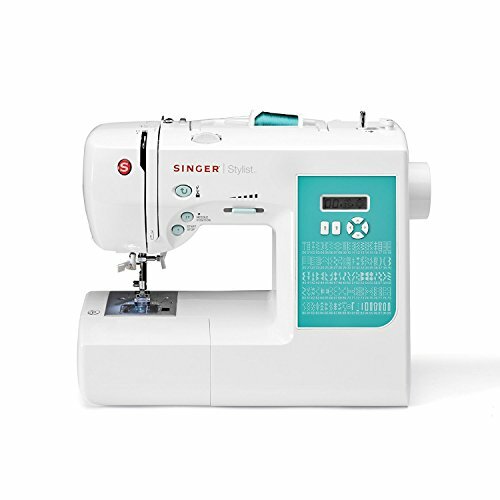 If you’re familiar with sewing but no longer spend much time perfecting your craft, the CE1008 makes it easy to do simple sewing task. You may need to knock together the odd Halloween costume for your child or repair a seam. With the CE1008, you won’t have to stare at it for half an hour trying to remember it works before you can hem a skirt. You may even find yourself falling in love with sewing all over again. 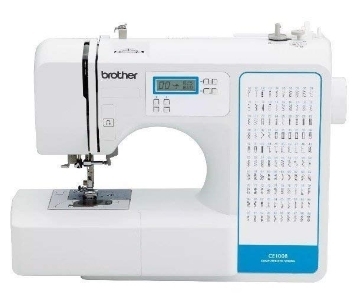 The Brother CE1008 has 100 unique computerized sewing stitches you can choose from the graphic panel. Select the stitch you need using the icon on the front of the sewing machine via the LCD panel. Choose from eight different styles of one-step auto-size buttonholes, too. The maximum stitch speed for the Brother CE1008 is 850 stitches per minute, with a max stitch length of 5mm and max stitch width of 7mm. You’ll find it easy to work with the bright LED-lit workspace. Cuffs, collars, sleeves, and even skinny jean hems fit over the free arm, which allows you to sew small items with ease. The Brother CE1008 features an advanced automatic needle threading system for those new to threading sewing machines. This feature is also a boon to those with decreased dexterity or poor eyesight. The quick set drop-in bobbin system also makes setting up easier for new sewers, as well. The seven-point feed dogs ensure that you get even tension in every seam without puckering or gaps. The Brother CE1008 also includes a drop feed for quilting and embroidery. Along with a host of stitching options and easy to set panel, the Brother CE1008 comes with many accessories. These additions will get you started on more complicated projects right out of the box without having to purchase them. You’ll get seven sewing feet, which includes a zipper foot, button sewing foot, buttonhole foot, overcasting foot, blind stitch foot, zig-zag foot, and even a foot for making monograms. Along with these accessories, you’ll receive several needles, include a twin needle and ballpoint needle. It comes with four bobbins, three spool caps, a spare spool pin, and a seam ripper. You’ll also get a screwdriver, cleaning brush, and operation manual so you can maintain your machine. Accordingly, you’ll be able to create an entire ensemble from start to impeccable finish without buying anything but fabric and notions. Best of all, the CE1008 has built-in storage for your accessories, so you don’t have to worry about losing those special feet or backup needles when you need them most. Dimensions: 11.65 inches wide by 7.01 inches deep by 16.26 inches high. Warranty: 1/2/25 year limited warranty. You’ll find the Brother CE1008 sewing machine affordably priced, depending on the retailer. While you can find this sewing machine online from Amazon, Walmart, and Jet, you may not be able to buy it from local brick and mortar stores. Brother has turned its distribution focus on newer models. This means that the limited number of machines available will continue to list for a very reasonable price. And while the focus is on newer models, Brother still provides tons of support for owners of the CE1008. You’ll find plenty of useful support information at their website, including the user’s manual, quick reference guide, and periodic releases about accessories. There’s no doubt that Brother makes a great sewing machine. And the CE1008 is a great starter model for new sewers and experienced sewers alike -- especially considering the low price. However, let’s take a look at how the Brother CE1008 stands up to other brands to see which one comes out on top. After all, if you’ have a flexible budget and need a bit more than the Brother CE1008 can offer, you may be better off with a Singer or Janome machine. Or even a different Brother sewing machine. That said, if the CE1008 is at the top of what you’d like to spend, you may prefer a less expensive model with fewer features. 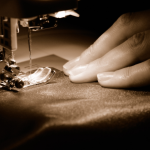 Sometimes, all the bells and whistles go to waste if all you do is fix seams or make the occasional throw pillow. Like the Brother CE1008, the Singer 7258 offers 100 computer-programmed stitches. You’ll also find a graphic stitch guide on the front of the machine for easy reference. The Singer “Stylist” features seven automatic buttonhole settings, as opposed to eight for the Brother model. It also features an automatic threading system, and stitches up to 750 stitches per minute, slightly slower than the Brother model. The Singer 7258 model comes with a wider variety of specialty feet but rings in at a higher price tag ranging from $215 to $300. Janome is a less familiar name, but the company has been a real contender in the domestic sewing machine market. The MOD-100 also features 100 computerized stitches, and like the Singer, offers seven automatic buttonhole settings. The company boasts of the back-lit LCD panel, which is admittedly easier on the eye than the Brother CE1008 display. The Janome model offers a one-hand needle threader for those who struggle to thread a sewing machine. Like the Singer, it sews at 750 stitches per minute, still slower than the Brother model. The machine only comes with four presser feet – a general purpose, zipper foot, satin stitch, and buttonhole foot. At a price range of $266 to $400, it’s pricier than either the Singer or the Brother models. While the Brother CE1008 is a great little sewing machine with a vast repertoire of functions, every consumer product has its pros and cons. Apparently, Brother has decided to focus on an updated model with a higher number of stitch options. This means you can find the CE1008 for a very reasonable price. However, if you feel you’re missing out on something, you may prefer to purchase another model. The Brother CE1008 only rated 4.0 out of 5 stars on Amazon but rated 4.8 on the Walmart website and 4.7 on the company’s website. What stands out is how few reviews the machine has actually gained overall. It seems that the Brother CE1008 never received adequate distribution before it was pulled from store shelves for newer models. 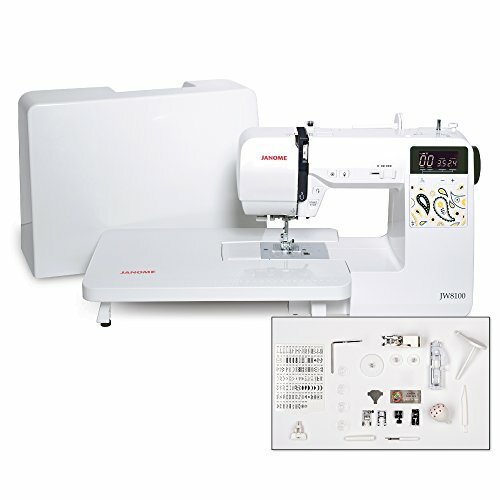 One example is the Brother HC1850, which offers 130 built-in stitches and increased quilting functionality. The Brother CS600i, on the other hand, may be more user-friendly, with only 60 stitches and seven buttonholes. This machine might be enough for most of us who use only the primary functions of our sewing machines. Although its smaller and has fewer features, the CS6001 runs about the same price as the CE1008. However, it seems to be a bigger hit with customers. It rates 4.6 out of 5 on the Brother website and the Walmart website, and rates 4.5 out of 5 on Amazon. These ratings averaged out over 10,000 reviews. Finding a sewing machine that will last you a lifetime can seem impossible. And it just may be. After all, sewing technology advances every year, especially with computerized models that can store and implement embroidery patterns. With features like automatic threaders and bobbin winders, it begs the question how far the technology will go in future years. The Brother CE1008 is a sturdy model with a huge selection of 100 stitches. It’s fast and comes with every accessory you need to get started. However, it may just not be the best model for you. Sometimes, manufacturers overload machines with more features than users actually need. In this case, perhaps 100 stitches is more than the average sewer needs. On the other hand, with the rising popularity of craft sewing, some users will need a machine better suited for quilting and embroidery. In that case, the Brother CE1008 will fit your needs. For beginners looking to produce finished projects without extra accessories or complicated machine settings, however, grabbing a Brother CE1008 while it’s still on the market may be the right choice.